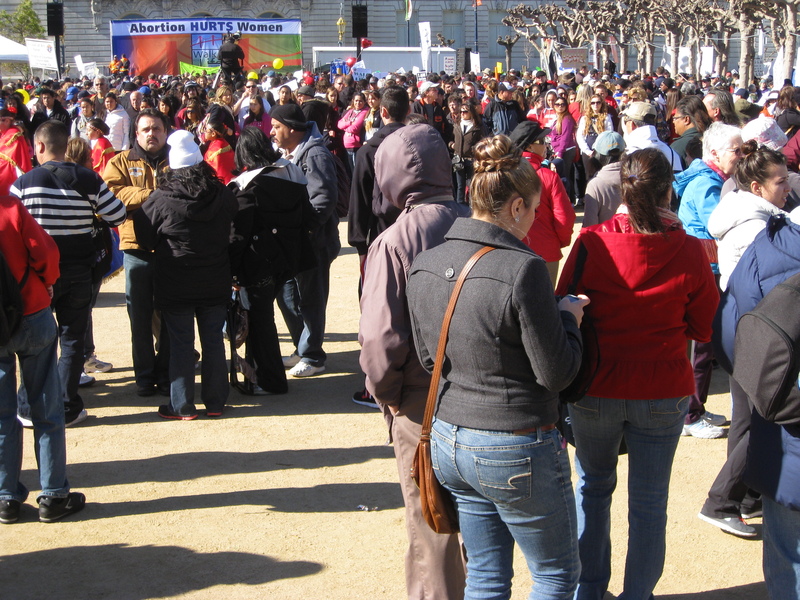 As reported (under the radar), the Walk for Life West Coast grew from last year’s attendance, topping the 50,000 mark. It was an incredibly beautiful, sunny day, and although the wind was pretty cold, we were so thankful (especially after seeing our brothers and sisters in DC braving below freezing temperatures the day before!). I attended the walk for the third year running now, and I never tire of meeting the people at this peaceful demonstration for life. Looking at the pictures, it amazes me to see the diversity. Young and old. Healthy and frail. People of every culture and skin color. 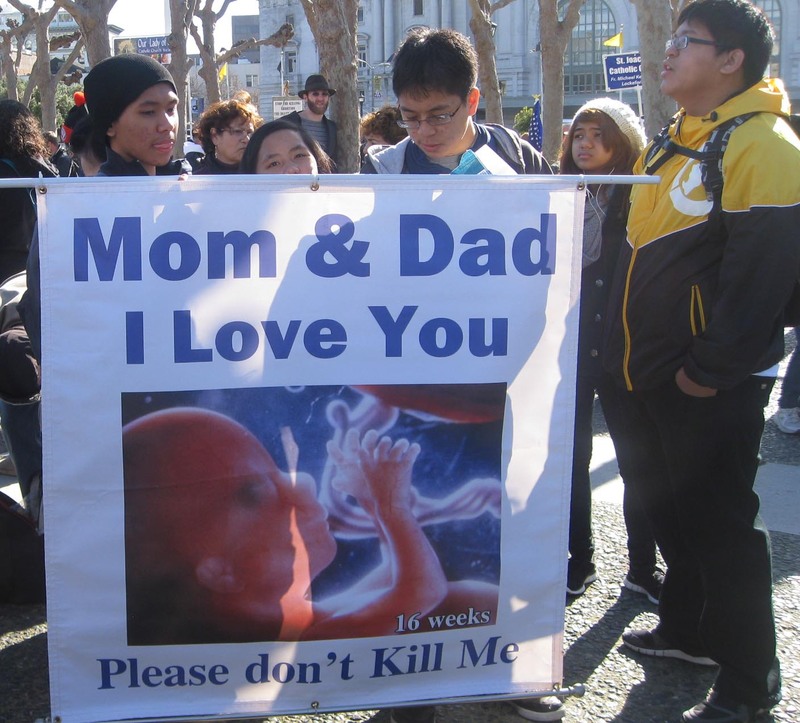 Most of them God-fearing, and all of them brought together for the sake of the unborn and their mothers. Here are a few pictures I managed to take during the day. Taken around 11:00am, with still an hour and a half to wait before the rally began. The ‘Abortion Hurts Women’ sign was the backdrop for the stage. Here’s some early arrivals with their own handmade signs. Young families were everywhere…lots of strollers and wagons! By 12:30, the crowd was pretty substantial, much more dense. Joyful anticipation in the air as the rally got underway! People are ready to march with their messages in hand. 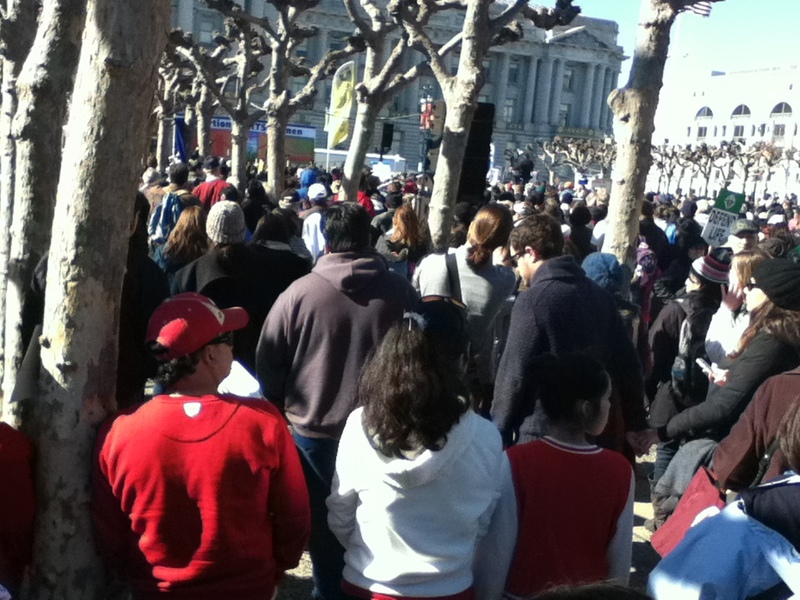 There were seven speakers at the rally, each giving inspiring testimony to their pro-life values. 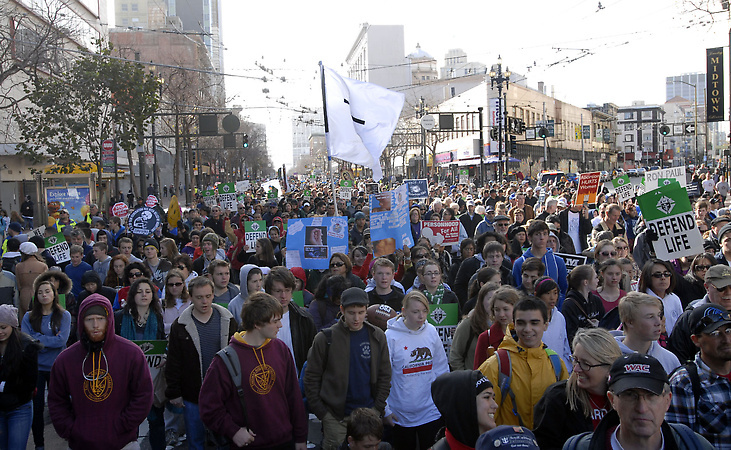 At the close of the rally, walkers readied their signs and quickly made their way to the McAllister and Market Streets. The Walk begins, armed with signs and prayer. This was a group of citizens, just as diverse in ethnicity as in various ages. Both young and golden years, walking together. 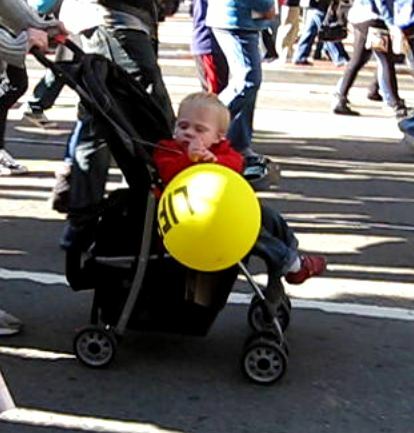 One of the youngest marchers armed with a ‘Life’ Balloon! 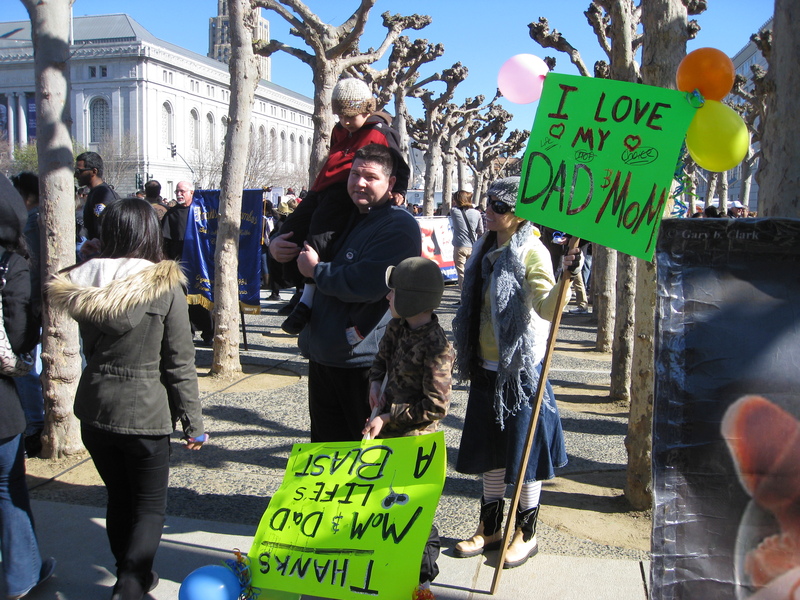 One of many Church groups represented, this one taking a picture at the END of the walk…lots of happy faces. 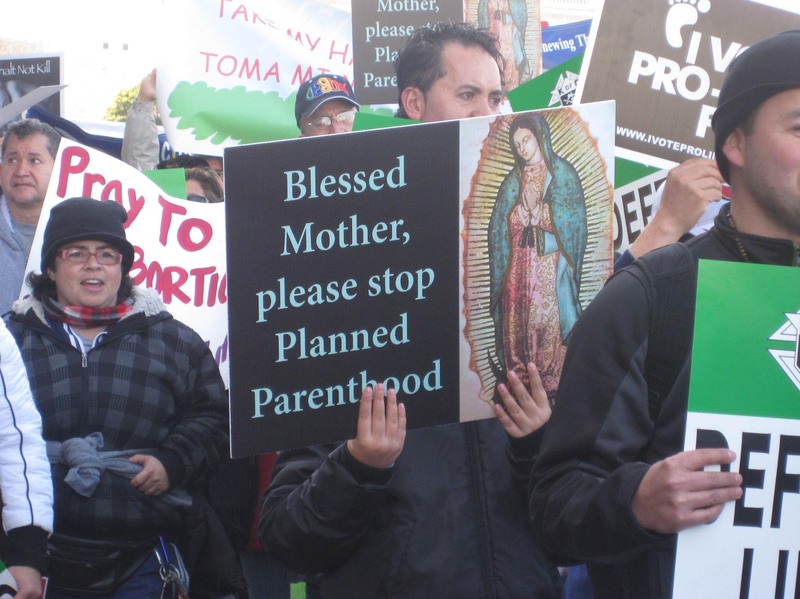 Of course, there were some groups protesting alongside the marchers, occasionally yelling out their position for having abortion on demand, sterilization and contraception freely available. 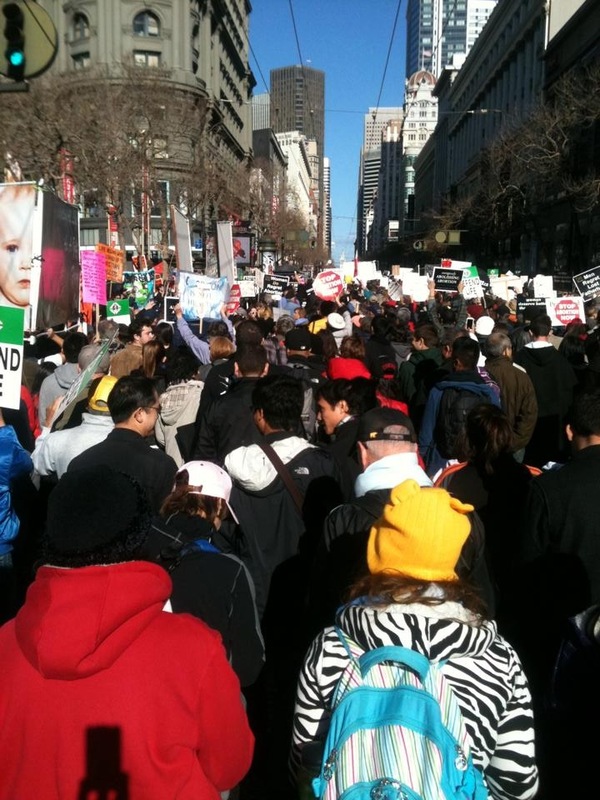 The pro-life marchers would simply drown out the opposition by shouting out ‘pro-life’ over and over again. Between the two groups, one distinction was clear. If one wanted to measure the difference between the pro-life movement and the pro-abortion, one didn’t have to look too hard to find it. Peace. Joy. Love. Kindness. Forbearance. Faithfulness. Self-Control. 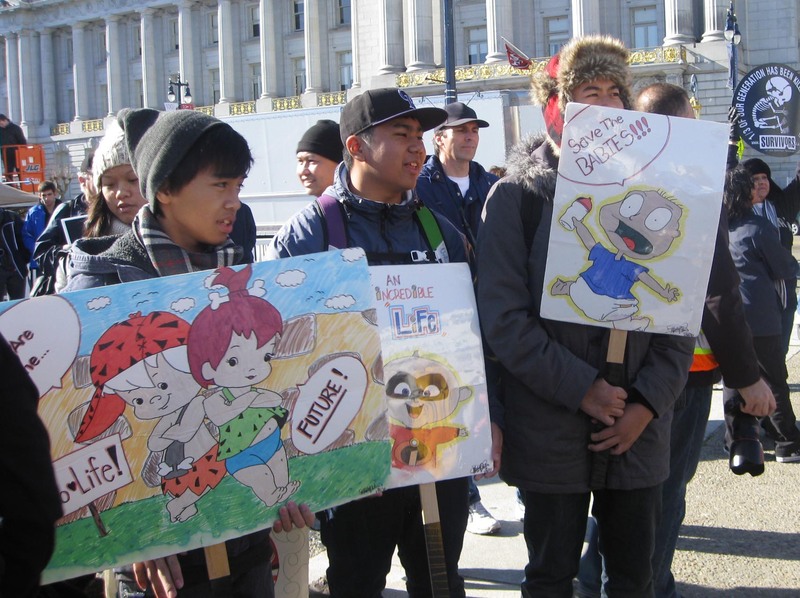 It was evident everywhere in the attitude of the marchers for life. And there is no law that can be made to take that away. Special thanks to Our Lady of Lourdes Parish in Sacramento, for letting me tag along for the day! And a special thank you to Matt Cassens at St Blogustine for asking if I’d be posting on the Walk this year. He posted too on the DC Event. My friends, last night someone close to me who works in a labor and delivery unit informed me she had to dress and clean a dying survivor of an abortion. 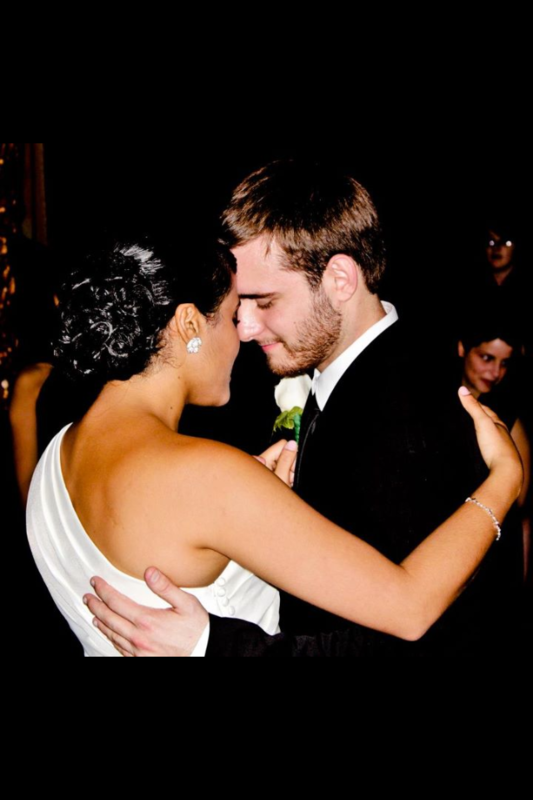 The patient was told by her doctors that her unborn child would have a low survival rate and took the doctor’s recommendation to abort her child. The child was then given a poison while in the womb and was expected to be a still born. However when the child was delivered the baby was found to be still alive but dying. My friend was then asked to take the now born dying baby to have the baby’s foot prints taken, cleaned, and dressed as his little heart grew weaker and the baby gasped for air. While the child was dying she was also told to prepare both a birth and death certificate. Finally once completed, she then proceeded to pray over the dying child as the baby’s soul departed this world. First please pray for the poor soul that was murdered and left to die (after birth) last night. Please pray for my friend who is now traumatized from having to witness and be involved in this act last night. Please pray for the mother that she come to repent for her actions but also find consolation from the void she now has. Please pray for the doctors and medical staff that recommended and performed this mortal sin. Finally please pay for me as well so that my wife and I will have the strength to comfort our dear friend. There are many unanswered questions that rise up in my mind, and make me realize how much work is yet to be done for the protection of the unborn. Is it possible that hospitals are still performing abortions today? The letter suggests as much. Was the mother counselled as to other options? We don’t know. Did the mother experience trauma, when she learned her child was not dead but dying? The baby was pretty far along for it to be a live birth after given lethal doses of ‘poison’ (perhaps saline injection, often used with babies more than 16 weeks old). Would the baby have survived if allowed to grow a little more in her mother’s womb? The birth and death certificate. The child was left to die with no medical assistance, other than to be cleaned and foot-printed, perhaps held by the assistant until death took her. Who is to blame? The doctor? The consenting mother? The assistant helping in delivery that day? A society that has lessened the life of this little soul for reasons we don’t know? Let us pray for all those involved in this case of abortion, and for all the others affected each day by abortion in our country and in the world. 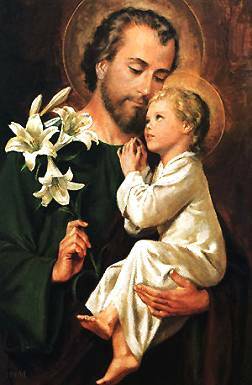 May our Lord open hearts to the truth of this terrible sin against life, and give us courage to continue to win the fight in protecting these little ones. This little soul wasn’t even given a chance, but was written off before she had wings to even try. Let us remind us of the miracle of life taking place in the womb, and pray for the day when a little girl will not be aborted and left to die. Life. Science is helping us to understand and marvel at the intricacies of the unborn child as it develops in the safe harbor of the womb. Eyes are being opened to see the humanity of it, and desire to protect its well being. Yet, the battle for life of the voiceless of our society continues. Over at Live-Action News, Cassy Fiano describes a recent episode of Dr. Phil, looking at the desire of one mother, Annette Corriveau, who wants to end the life of her two disabled adult children (hat-tip, Andrew and Christina, blogging at Caffe con Leche). Corriveau is not, of course, the first parent to think of ending the life of her child outside the womb. Cassy reminds us of the case of Robert Latimer, who took the life of his daughter by leaving her in the cab of his truck and let her die of carbon monoxide poisoning. She was 13 years old and had cerebral palsy. What stuck me the hardest about the Dr Phil show, beyond how inconceivable it is that a parent would want to kill their child, was the reaction of the audience. 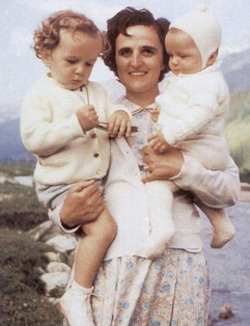 When asked by Dr Phil if they agreed with Corriveau and her desire to kill her two children, the large majority of the audience raised their hands. My first thought when I heard this story was, at what point do we draw the line? If the popular vote to kill two adults just because their mom decides they would be better off, who is safe? What is the measure of value of a person’s life? And who is capable of making that decision? A thread of such thought has been present throughout the history of civilization, and at times grew without any check and balance. This lack of balance led to atrocities against humanity. The natural law has always provided the necessary balance. This balance is lost when life is measured as a commodity, valued only for what it gives back to society, when the innate understanding that killing another human being is suppressed. There is no longer a measure to the fair treatment of peoples. Where does it end? Another question to ask is, How did this all begin? Here’s one written by Mark Pickup, from the perspective of disabled man. And, a humbling reminder to us, that the choice of a loving parent is never an easy thing to do. Who has the answers? This is a older column by Chelsea, but gets to the heart of this issue, questioning the value of human suffering. 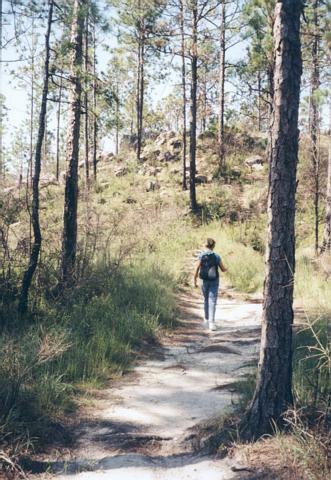 When walking in the woods, there is an amount of certainty when there is a worn path under our feet. That assurance lets us venture deeper into the wilderness with confidence we will arrive at our destination, so long as we stay on the path. At first, we follow diligently, with healthy caution to guide us. But as we go along we find ourselves more at ease, and take a few steps off the path to inspect a little closer one thing or another. Our caution stays with us, prudently keeping the path in view, so not to lose our orientation. But then, something goes wrong. Click here to read the rest at Ignitum Today. Look at the Happy People! Steven Ertelt and Elizabeth Scalia have some good insights on their posts regarding the president’s remarks. But beyond the numbers the stark contrast comes with what the scriptures refer to the fruits of the spirit: love, joy, peace, forbearance, kindness, goodness, faithfulness, gentleness and self-control (Galatians 5:22-23). Walking shoulder to shoulder down Market Street, despite the early morning chill still in the air, my heart was warm, to be in the presence of a joy and peacefulness that filled the air. It was almost intoxicating, to the point the small bands of protesters we passed by were hardly noticed. The evidence of these ‘fruits’ in one’s life, points to the presence of the Holy Spirit working in him. Where we see the fruits manifested, God’s presence is there. 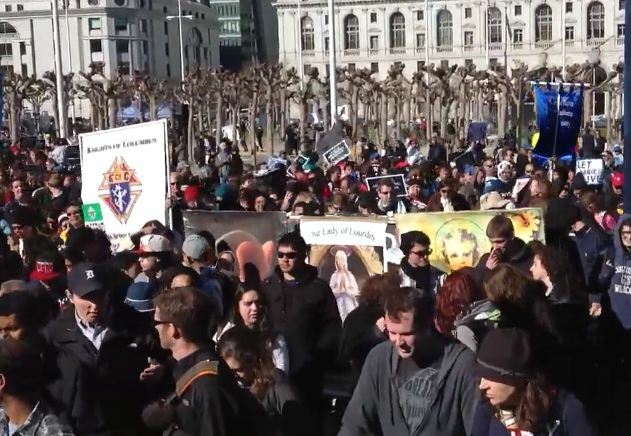 May the Lord bless each person who took a stand for life in all its stages, from the San Francisco Bay to the Washington Mall. May their voice continue to resound through the whole world, and may God be with them, that they will continue to reflect joy to the world. The difference my friends between those who, we will meet some of them today, who advocate for legal abortion, and us who advocate for life, is not the difference they want the mother to think it is. They want the public to think that we stand for the babies, and they stand for women. But that’s not the difference between the two sides. The difference between the two sides in this monumental struggle, in our nation and in our world today, is they think that you can separate the mother from child and we say you can’t. You cannot love one without loving the other. You cannot protect one without protecting the other. 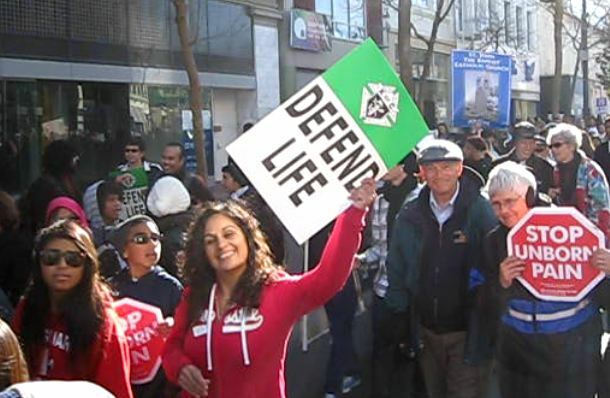 Pictures from this years Walk for Life West Coast, 2012, including one with me with Fr Pavone. enjoy! 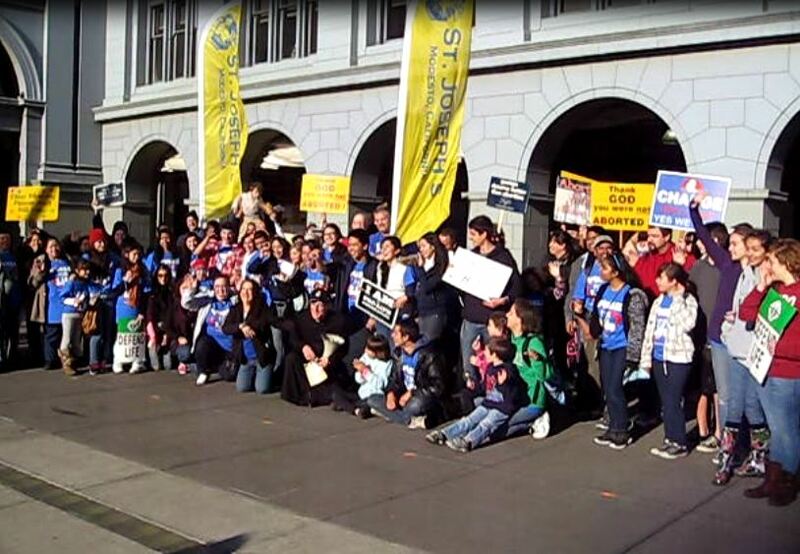 This past Saturday was the day of the Northern California Pro-Life Walk-a-thon. I drove down to Elk Grove Park with Our Lady of Lourdes Parishioners, Soraya and her mother Ana, to lend our support (and stretch our legs) in the 3.6 mile walk. All the proceeds for the day went to help fund five crisis pregnancy centers in the Sacramento Diocese. 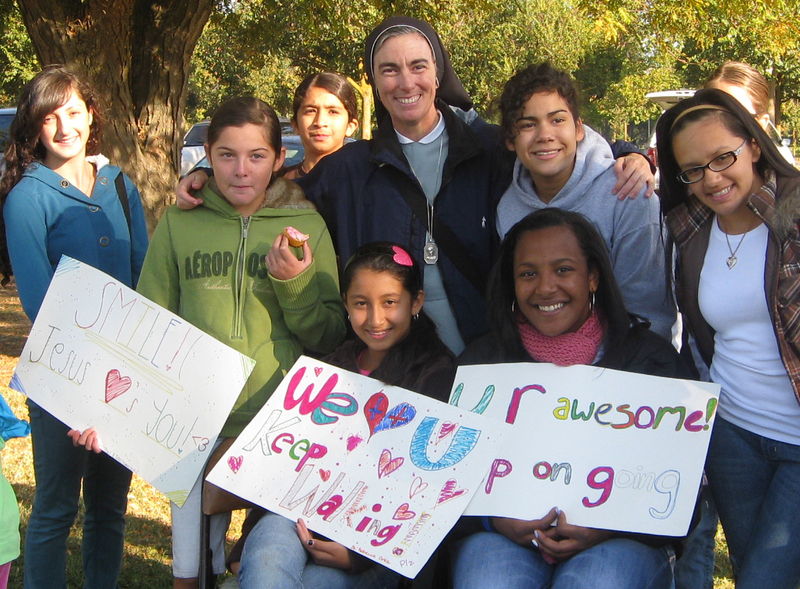 One of my favorite parts of the walk were the very awesome and enthusiastic junior high schoolers from St Joseph’s Parish in Elk Grove, who made us feel like hero-marathoners every time we passed the water and cup-cake table! THANKS SO MUCH for the smiles and joy you brought to all of us! And of course, all of the smiles and walking and encouragement was for one purpose; so that little ones will have a chance to take hold of life and run with it, like this little walker does!. A Big THANK YOU also goes out to all of my sponsors for the walk-a-thon. There are a few donations still coming in, and I think we (you and I) will just break $1,000 to help out those CPC’s! Put that together with the numerous priests of the diocese who also hit the trail, we can rejoice! Next year, it will be even better, I am sure. May our Lord bless each of you, as we continue to work to defend life in all its stages. 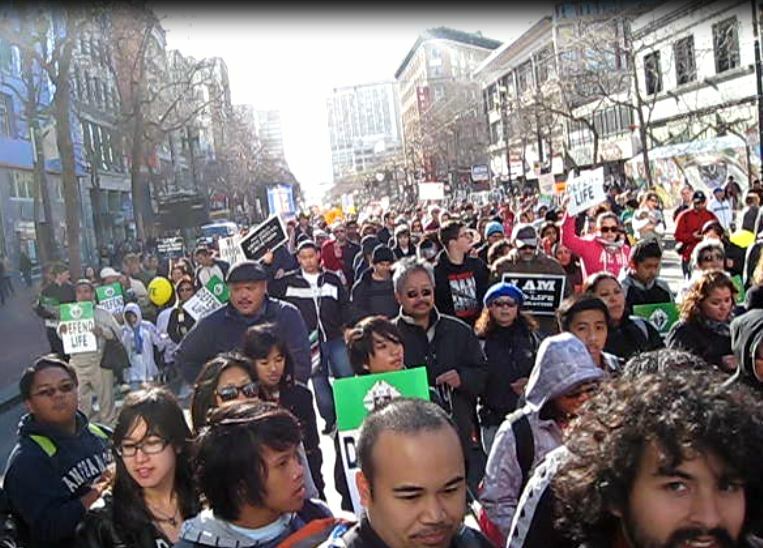 Next Event: Walk for Life West Coast, in San Francisco on Saturday, January 21st, 2012. For more information, check out the website. I’ve already reserved my space on one of the many buses coming from Sacramento, CA for the event. Are you coming? Let me know! I’d love to meet you! 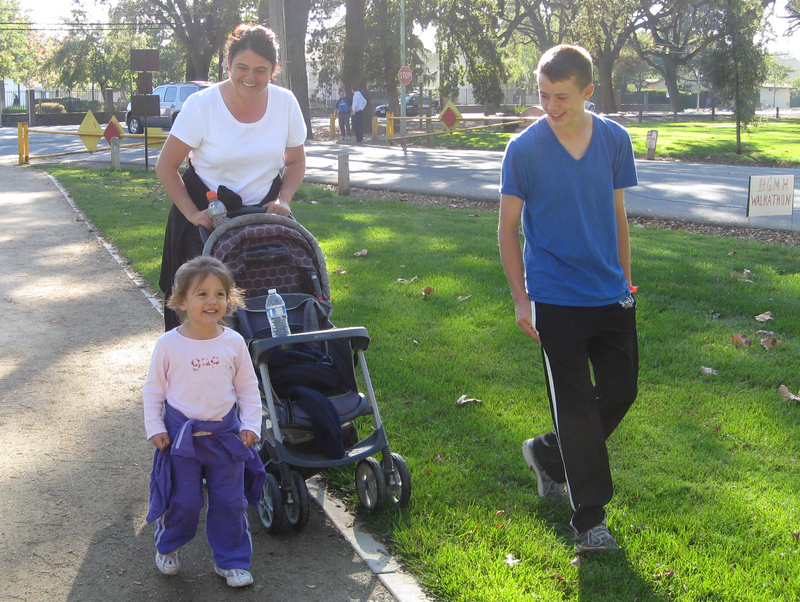 I posted a while back that I would be walking, to raise money for five crisis pregnancy centers in Sacramento Diocese. That walk is just two weeks away! Today, I had the pleasure of sitting down with Bob Dunning, the host of the Bishop’s Hour on Immaculate Heart Radio to talk about the walk-a-thon. It was my first time on radio, so I didn’t know what to expect. Bob and I, talking about the walk and prolife issues. Pray for the women in need of assistance. Pray for success of the Walk. Ask the Lord how you can contribute. On the pull-down menu, select “I want to sponsor a walker in the walkathon.” Click to proceed. Scroll down, fill in the necessary information. Choose which of the five crisis pregnancy centers you wish your donation to support (you can learn about the centers at below links). List amount you plan on sponsoring me for. 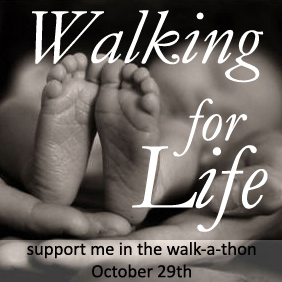 If you would rather sponsor a walker by check, make your pledge at the site above, and instead of continuing when you are referred for payment, please make it payable to: Catholics for Life. Include a note containing the name of the walker you wish to sponsor and the name of the CPC to which you wish to donate the funds. Mail it to: Catholics for Life, P. O. Box 156, Carmichael, Ca. 95608. If each visitor donates one dollar, that’ll be a tremendous help! For more information about the walk, go to the Walk-a-thon website. Or, read the flyer here. 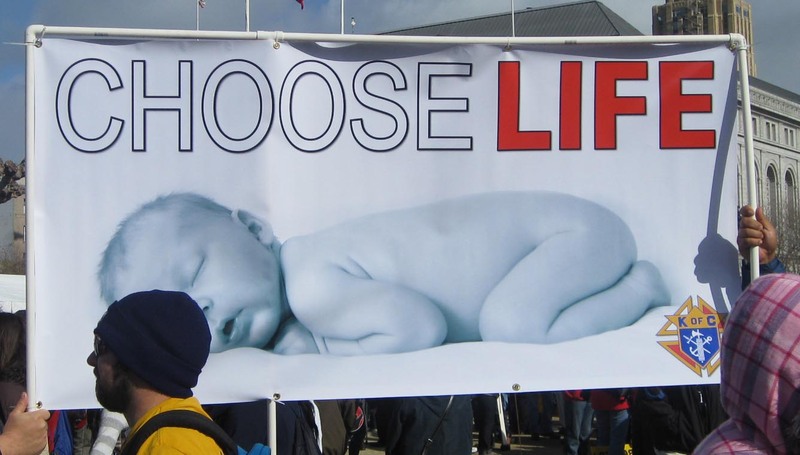 “We do not often think about the generational effect of ‘just one abortion’. The taking of one single life wipes out the countless souls who would have followed in all generations to come. So, looking at my own ancestry, I did the math. How many would the effect be in your family? Ranking the Saints, and a response to the question of infant mortality.